When the going gets tough the tough get going…..
Lakshmi Ravichander is blessed to have been born in to an illustrious family of artistes. Granddaughter of legendary pioneer film director, K.Subrahmanyam, she had her initiation in media under her father Dr S.V. Ramanan and in the art of organisation and management from her Mother Bama Ramanan. Training in Bharatanatyam from a tender age under her aunt, the world renowned Dr.Padma Subrahmanyam and living in a home that resonated with the sounds of music and dance, instilled in her a great love for the arts. Lakshmi is married to Ravichander aka Ravi Raghavendar , who is one of the founding members and the president of Yes Bank and also a popular actor. Thus the couple successfully straddle both the corporate and artistic worlds. 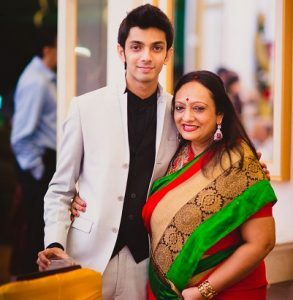 They are blessed with two children – Vaishnavi a daughter who is a lawyer and Anirudh who is a popular music composer. At a very young age, Lakshmi , along with her father started lending her voice for radio and Tv commercials and along with her sister Saraswathi, she wrote and directed television serials. Event Art, the event management company she co founded with her sister, has carved a niche for itself in the space of Corporate events, Wedding planning and Stage shows. As Anirudh’s popularity soared, Lakshmi’s organisational skills and astute planning has seen her easily slip into the role of a person who manages his back office and helps in planning and execution of his work apart from being the team leader of all his International tours. Today she plays various roles – of a succesful enterpreneur, the wife of a corporate honcho, and the mother and manager of the most sought after music director. We caught up with her as she gladly shared her experience with the same joy and enthusiasm we see in her while she exercises at SPARRC. How did your transformation happen? It was my 50th birthday and my family had gifted me a holiday in Dubai, a surprise, since everyone is so busy and it is difficult to get together often. There we visited the Dubai Mall where I realised, I just couldn’t walk, my legs were paining so badly. I was stuck and thinking I’m only 50 and what have I done to myself that am not able to walk. I was outwardly pretending to everyone that I was having a good time but internally going through alot of pain day and night. During one of those nights in pain, it suddenly came like a wave to me, I know Dr. Kannan Pugazhendi from his YMCA days and how much relief he gives to many people, why haven’t I gone and seen him. If I want to get fit and take control of my life at 50, I should go to him. His wife Mrs. Sujatha is a very dear friend so I called her from Dubai and I said I’m coming straight to see you. She put me onto Mr. Arjun and said what you need is a much specialised program because you have let yourself go. I have a lot of work commitments plus my son Anirudh’s work which I take care of and as a result I had completely let myself go. I started coming to SPARRC every day and slowly I started recovering from all my ache and pains and started doing strengthening exercise and then from there on there has been no looking back. It has been close to 2 years now. When you exercise you start feeling so good about yourself. You want to lose weight so you also start eating healthy, take to a healthy diet and along with regular exercise and I lost 9 ½ kgs over one year. What is the change you see in yourself? I got a lot of my self confidence back. Usually before I started coming to SPARRC, when I wake up in the morning, I used to think Can I walk today? Will I be in pain? When I can go lie down again! But nowadays am just up and out of bed to get on with my day. Special mention here to Mrs. Sujatha and Doc, who are so kind to me. I was given good training under a group of people. Mr. Arjun is whom I started with, Physiotherapist Ms. Devipriya was very helpful in getting me to recover through therapy and rehabilitation. Mr. Sudhershan, Mr. Dinesh, Mr. Venkat, Mr. Prashanth, all of them pay attention to my specific needs with regards to exercise. How did you fit exercise into your daily routine? I have my work, my son’s work , my husband’s social commitments since he is a president of a bank and other social commitments but I think I was using all this as an excuse until I got my wakeup call in Dubai. One day I heard someone, a friend tell me, when I apologised for not calling her back saying I was busy, she said even Barack Obama plays golf, he makes the time. I just decided to make the time to take control. Don’t ask me how, I just do. Sometimes I come to SPARRC in the afternoon, sometimes at 7pm or early in the morning but ensure I am exercising at least 4 to 5 times in a week. Your transition from impossible to possible? Walking was an agony, I have revisited Dubai mall twice in these 2 years and each time I test myself to see how far I go this time to know my pain threshold. Yes I do experience pain, I won’t say there is completely no pain, due to many years of wrong postures and overuse of muscles, I can see the recovery happen and progressing forward. Even here at SPARRC every one of the staff keep an eagle eye to watch my posture and correct me accordingly. But I have now progressed to a level where I can take a flight and go somewhere on my own. Do you have a substitute for exercise? No replacement for exercise. Yes, I love music, it is an integral part of my life. But my exercise is a whole different thing for me. People do ask me why am I spending 2 hours in the gym, but then it is not that I am lifting weight for that long. I take my time doing my stretches before and after workout giving my muscles proper recovery. So my 2 hours is my time, my exercise time. Some people go out to a coffee shop, meet friends etc. for me these 2 hours of exercise is my time. Favourites as far as exercise goes? If you ask me to walk on a treadmill for 30 mins I don’t think I’ll ever do it because I get bored. I like weight training, circuit training, suspension training. Many times I do miss my exercise and if it is for more than 2 days the guilt sets in and the not wanting to go back to where I was, gets me back on track. The other beautiful thing about SPARRC is that during your mid life, when one’s body is going through hormonal changes every now and then there is bound to be a muscle spasm somewhere or the other. All I have to do is tell the Fitness Advisors, immediately I will be sent for therapy, quick 5 min session and am back resuming my exercise. This luxury I know I won’t get it anywhere else. Another thing about coming to SPARRC is where ever I exercise, on one side I have this Aachi who is 65 to 70 years old, doing crunches, stretches and what not, which is as motivational and inspiring as watching all the sports people who come here. At SPARRC you can see either ends of the spectrum. Normally we see highly motivated sports people training or middle aged people exercising at some gym. While I exercise I get to see a state champion on one side, house wife doing suspension training on the other side, an elderly doing circuit training and at times even kids enjoying themselves while they exercise on the Swiss ball. This is an everyday scenario at SPARRC which I have never seen in other such centres or gyms. Does your family exercise as well? Yes, they do. My husband is a cardio person, always into aerobic exercise. In fact I keep telling him to do a proper warm up, cool down and to stretch as well. My son is a basketball player. My daughter is into Yoga. So each one does something or other. The most important benefit from exercise is that it brought about so much of physical awareness in me which my family has noticed as well. I have learnt to watch and correct the way I sit, stand and walk so that I cause the least amount of damage to myself. When I am at a show watching something I ensure I sit erect with my feet on the ground. Exercising has disciplined me completely.